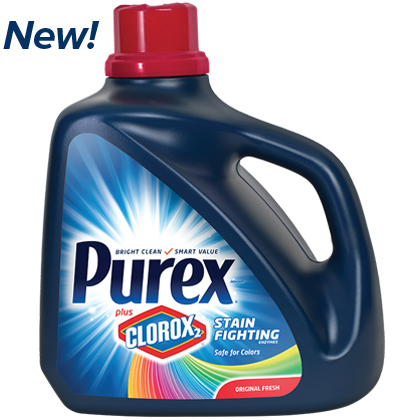 Purex plus Clorox 2 offers powerful stain fighting agents that works on over 100 different stains! Of course I was intrigued with this new version of Purex. My family of four seems to attract multiple stains on a frequent basis. I am afraid to purchase any light colored clothing out of fear that they will be ruined within a short amount of time. Imagine my horror when the high school had required the graduates to wear a white button down dress shirt and light khaki pants! I have not tried to use this product on my husbands work clothing yet. His stains are normally difficult to remove as they contain oil and grease. I've used other Purex stain fighting detergenst on his clothes in the past with decent luck. The products do not always remove every stain from his work clothes, but I have noticed a difference when using them. I highly recommend pre-treating tough stains by rubbing the detergent on the stain and allowing it to sit for a few minutes before washing. Purex plus Clorox 2 detergent claims to remove the toughest stains. I'm always a little skeptical of detergents that include bleaching agents in their products. However, this product is formulated to be used with colored clothing and materials. Purex plus Clorox 2 contains stain-fighting enzymes that help remove starchy stains, protein-based stains, guar gum type stains, and other various types of stains. HOW TO ENTER: Please enter via the Giveaway Tools form. RULES & DISCLAIMER: A sample has been provided in return for sharing this giveaway with my readers. All opinions are my own and true. The odds of winning are based on the number of entries received. Winner will be generated from the total amount of entries through the Giveaway Tools application. Open to the US 18+ only. Confirmed Winner will be contacted via email. Winner will have 48 hours to respond before a new winner is chosen. Winner is responsible for making sure their mailing address is correct. No P.O. Boxes will be accepted. No purchase necessary. Void where prohibited by law. The blog owner will be responsible for product shipment to winner of this giveaway. This giveaway is in no way administered, sponsored, or endorsed by, or associated with, Facebook and/or Twitter, Google, Pinterest. This disclosure is done in accordance with the Federal Trade Commission 10 CFR, Part 255 Guides Concerning the Use of Endorsements. I would like to try the Purex2 Stain Fighter & Bright Booster. Other than this new Purex variety, they don't make anything we don't already use,or have used in the past, unless you count particular scent of certain products. Just looking through my laundry room I see Crystals and dryer sheets, as well as liquid detergent. I'd like to try Purex Crystals. I would love to try the Purex plus Oxi Laundry Detergent. I would like to try the Purex Free and Clear Laundry Detergent for Sensitive Skin. The Purex Crystals are a great way to add a little extra scent to your laundry. I like the Purex Crystals Aromatherapy in Serenity. I use their dryer sheets, but I have never used the dryer sheets with Crystals. I like the Purex Crystals and dryer sheets. I would also like to try the Crystals in other scents. I would also like to try Purex Crystals. I am going to try the dryer sheets with crystals. Fels-Naptha Laundry Bar. I've always heard how great it is so want to give it a go. The Fels-Naptha bar is a great product! We keep them in the house. They are very affordable as well. I normally pay $1-$2 for a bar that lasts quite a long time. We use the mountain breeze scent of the liquid detergent, so I would like to try some of the other varieties. I want to try the Purex Fabric Softener Dryer Sheets in sweet lavender. I want to try the Purex dryer sheets with crystals. Another one I'd like to try is the Purex plus Oxi Laundry Detergent. The Purex Crystals are a great way to add a little extra scent to your laundry!! I want to try the purex crystals dryer sheets. I would like to try the dryer sheets in the sunny linen scent. I would love the try the Purex dryer sheets with crystals!